Thanks to its huge sales and high memory usage, Apple’s iPhone is expected to generate insatiable demand for NAND-type flash memory in 2010, helping to strain supplies for the year, according to iSuppli. STMicroelectronics, which owns the trademark for the IPAD, has now launched the iNEMO, a family of multi-sensor Inertial Measurement Unit (IMU) devices combined with micocontrollers. The integration of a variety of motion, magnetic, pressure and temperature sensors with a 32-bit processing unit and dedicated software in one package will lead to leaps in functionality and performance in a wide variety of applications, including Gaming, Human Machine Interface, Robotics, Portable Navigation Devices and Patient Monitoring. The very specific iNEMO naming does indicate that ST intends to keep the iPad branding, used recently for Apple's tablet PC, or at least will build a case to extract a signifcant amount of money. 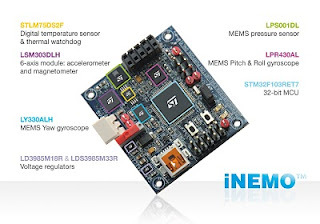 Members of the iNEMO family of modules offer combinations of 3-axis sensing of linear, angular and magnetic motion with temperature and barometer/altitude readings, representing ST’s first IMUs with 10 degrees of freedom. The modules contain a memory card socket for data logging and dedicated connectors for wired/wireless connectivity, including USB, ZigBee or GPS. ST’s first iNEMO module (STEVAL-MKI062V1) integrates six different sensors and a 32-bit microcontroller and it is available as a 4.5x5cm evaluation board with a firmware library, a PC Graphical User Interface, and a set of software solutions for different applications. The most recent iNEMO product (v2) represents a further step in miniaturization and runs a sophisticated sensor fusion algorithm (Attitude Heading Reference System) to provide static and dynamic orientation and inertial measurements. This iNEMO v2 integrates five ST sensors – a 2-axis roll-and-pitch gyroscope (LPR430AL), a single-axis yaw gyroscope (LY330ALH), a 6-axis geomagnetic module (LSM303DLH), a pressure sensor (LPS001DL) and a temperature sensor (STLM75). All the sensors and the AHRS algorithm are managed by an on-board STM32 microcontroller. The module, which comprises a 4x4cm evaluation board and all the necessary firmware and software, will be available for volume orders in Q2 2010. “The introduction of iNEMO modules confirms ST’s industry-leading capabilities in providing all the sensors and processing capabilities required by the market. When it comes to sensors, we are the one-stop supplier,” said Benedetto Vigna, Group Vice President and General Manager of the MEMS, Sensors and High Performance Analog Division at ST.
“At the forefront of the MEMS technology development, the iNEMO family roadmap heads toward inertial measurement units delivering ten degrees of freedom in a single package,” added Matteo Lo Presti, General Manager of the Subsystems Product Group. Texas Instruments has developed the first truwe single chip to integrate WLAN 802.11n, GPS, FM transmit/receive and Bluetooth technologies. The 65nm WiLink 7.0 solution reduces costs by 30 percent, reduces size by 50 percent and delivers superior coexistence performance as compared to today’s existing solutions. Built on seven generations of proven technologies and legacy software, this single-chip solution further extends TI’s heritage of bringing technologies previously seen in high-end devices to the broad mobile market. The WiLink 7.0 solution is sampling to major OEMs today. 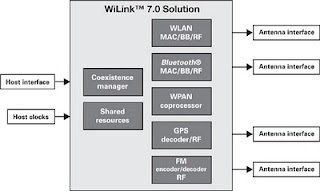 Devices using the WiLink 7.0 solution are expected to enter the market by the end of 2010. Micron Technology has bought struggling NOR flash memory joint venture Numonyx for $1.27bn in Micron shares. The transaction really strengthens Micron’s position as one of the world’s leading memory companies, with a broad portfolio of DRAM, NAND and NOR memory products and strong expertise in developing and supporting memory system solutions. Micron would also gain increased manufacturing scale globally and access to Numonyx’s customer base, providing significant opportunities to increase multi-chip offerings in the embedded and mobile markets.Using shares, rather than debt, as well is a good move. Altium has expanded its range of low cost, rapid prototyping boards with a new NanoBoard 3000 hosting the Altera Cyclone III FPGA. The new board provides electronics designers with the same hardware, software and ready-to-use, royalty-free IP of the NanoBoard 3000, but with the power of Altera’s low-cost, high power Cyclone III FPGA at its core. With the board, electronics designers have everything they need to design and deploy sophisticated FPGA-based designs. Complete with hardware and software, the NanoBoard 3000 eliminates the need to search the web for drivers, peripherals or other software. It is a low-risk, low-cost design alternative for electronics designers looking to move beyond the constraints of fixed hardware. "As we said last September, electronics designers without any prior FPGA skills can use the NanoBoard 3000 to construct sophisticated ‘soft’ processor-based systems inside the FPGA," said Nick Martin, CEO of Altium. "Using their existing board layout skills and Altium’s intuitive graphical interface, electronics designers can construct, test and implement entire FPGA-based embedded systems. This new addition to the range provides the perfect entry point for electronics designers, as it exploits the low-cost, high power benefits of the Altera Cyclone III in an easy-to-use and easy-to-deploy electronics design environment." The new NanoBoard 3000AL and NanoBoard 3000XN (hosting the Xilinx Spartan 3 FPGA) cost just €295, including software, hardware and Altium’s royalty-free IP. Electronics designers can also exploit Altium’s vast range of learning materials and reference designs to get them up and running immediately. Designers looking to deploy their designs can also purchase one of Altium’s modular commercial enclosures. Available in a variety of sizes, the modular commercial enclosures will let designers go from prototype to deployment in a single step by simply snapping the NanoBoard 3000 into the enclosure. The NanoBoard 3000 is available for a recommended retail price of €295 and includes a 12-month subscription to an Altium Designer Soft Design License which also includes all software updates released by Altium during the 12-month subscription period. Users of the latest release of Altium Designer can also use the NanoBoard 3000. Designers can purchase a NanoBoard 3000 from Farnell at: http://uk.farnell.com/altium. Cambridge Consultants has launched a comprehensive development platform for the rapid development of highly differentiated Bluetooth products and mobile accessories. 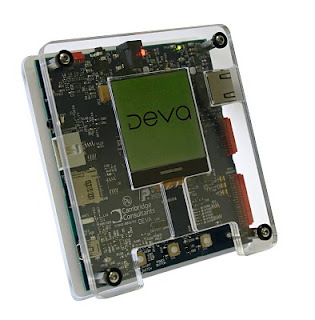 The DEVA platform allows electronics and software engineers to rapidly prototype and test accessory products that deliver new features for users before committing to final product hardware. By accessing the full power of the BlueCore-5-Multimedia device from CSR, it enables the development of highly differentiated products that maintain very low product cost. DEVA can be used to develop a range of novel Bluetooth products - from mobile phone accessories and headsets, including for Apple’s iPhone, to wireless payment systems, industrial remote control devices, sports activity monitors or telehealth sensors that can be compliant with the Continua Health Alliance’s guidelines. The key value of the DEVA platform is that has been optimised to work with all of Cambridge Consultants’ existing software tools and libraries, including its generic Bluetooth tool, xIDE for Interface Express, its Continua Compliant wireless health platform, VENA, and its Internet service accessory platform, CatchNet. DEVA can also be used with CSR’s BlueLab development suite. DEVA provides developers with access to the comprehensive features and processing power of CSR’s market leading BlueCore-5-multimedia chip. DEVA includes a 128x128 monochrome LCD display, three user-interface buttons and LEDs allowing rich user interfaces to be developed for the product. With USB, Serial and MicroSD interfaces for data integration, a range of GPIO, and both digital and analogue stereo audio connection, DEVA can support the development of complex products that have the lowest possible cost in their final manufactured form. Being battery powered, DEVA provides a completely wireless experience.